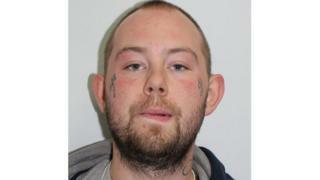 A man named as the chief suspect in an acid attack in east London has handed himself in to police. Two people suffered "life-changing" injuries when a corrosive substance was thrown on to them through their car windows. Cousins Resham Khan and Jameel Muhktar, 37, had been celebrating Ms Khan's 21st birthday before the attack. John Tomlin, 24, has been arrested on suspicion of grievous bodily harm with intent, the Metropolitan Police said. He walked into an east London police station on Sunday and remains in custody. Ms Khan, a student at Manchester Metropolitan University, and Mr Muhktar suffered severe burns to the face and body in the attack on 21 June. Police said they had stopped at traffic lights when a man approached them and threw the toxic substance at Ms Khan through the window. The attacker then threw more of the acid at Mr Muhktar before fleeing the scene.